When you get allergies, you might blame your triggers—the pollen in the air or your best friend’s cat—for your symptoms. But actually, most of those things are harmless. What really causes allergic reactions is your immune system and its overreaction. Convinced that it is under attack by dangerous allergens, our body does everything it can to get rid of them—it makes us sneeze to clean out our lungs and nasal cavity, it produces mucus that flows abundantly through our nose, it makes us tear to clean out our eyes, and triggers inflammation and conjunctivitis (scratchy eyes) to destroy these foreign antigens (foreign bodies causing an immune reaction). Our immune system then releases a chemical known as histamine, which is stored in our mast cells. Histamines act like bouncers at a club. They help your body get rid of something that’s bothering you—in this case, an allergy trigger, or allergen. But our mast cells are mistaken! We are not attacked by dangerous allergens, but by innocent grains of pollen, cat hair or dust. To fight against allergies, our body must learn to distinguish dangerous foreign agents from those that are not. However, it can only learn if it is confronted with a wide variety of microbes. Excessive hygiene deprives our bodies of the necessary opportunities to exercise its response. This may in fact justify the sharp increase in allergies in our industrialised societies today. Due to our need to constantly disinfect and sterilise, we may be disorienting our immune system. 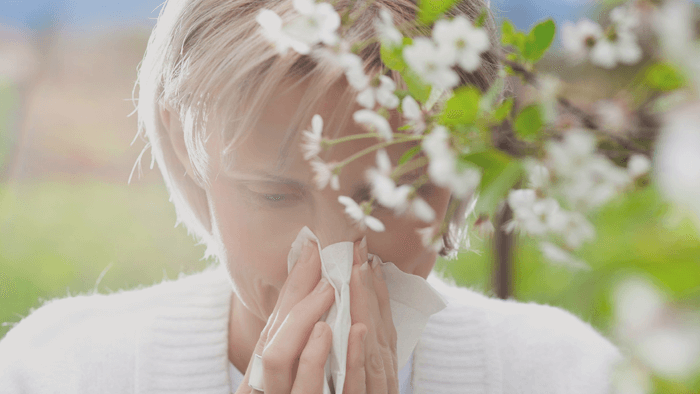 As spring arrives and as the first waves of pollen are on their way, here are some exciting new tips that will help you better fight allergies. Researchers at Sweden’s University of Gothenburg have recently discovered that children raised in homes that do not use a dishwasher have half the number of allergies as children who were. These kids were much less likely to suffer from eczema, asthma and hay fever. This could be partly explained due to the fact that dishwashers work on higher temperatures of heat. And as a result, kitchen utensils come out largely sterilised, as most microbes have been eliminated. Children who eat with these utensils are therefore less exposed to bacteria and other antigens. Their immune system is less stressed, and so it loses its precision—it is more likely to be proven wrong and to react to the wrong agents, thereby causing allergies. Children who eat fermented foods, unpasteurised farm products (such as butter, cheese, milk), as well as organic fruits and vegetables have fewer allergies. Also quite interestingly, research has demonstrated that children born from women who take probiotics (healthy bacteria) during their pregnancy are more resistant to allergies. Children who take daily probiotics also see their risk of eczema drop by 58%. Additionally, children who grow up in aseptic interiors, and do not come into contact with animals, insects, plants, flowers and pollens are more likely to suffer from asthma and hay fever. In one study, school-aged children drinking raw milk had 41% fewer risks of having asthma, and 50% fewer risks of having hay fever than children who drank UHT milk. Our society is obsessed with cleanliness, and this is especially true when it comes to children. However it is becoming increasingly clear that contact with nature and natural things that may be considered ‘dirty’ may in fact good be essential for keeping the body in check and working healthily. A biochemist at the University of Saskatchewan in Canada has gone so far as to claim that nasal mucus has a sweet taste that makes you want to eat it! He claims that children who eat their boogers are in fact introducing pathogens into their bodies, which then results in the stimulation of their immune system, which then strengthens their natural defences. Mites are one of the most common allergens and frequently trigger asthmatic symptoms. However regular contact with dust mites reduces the incidence of allergies by 63% in children. Researchers also found that city-dwelling babies exposed to cockroaches, mice, dust, mites and other allergens during their first year were less likely to suffer from age-related allergies. The conclusion is clear—the environment is certainly an important factor of allergies. A child who grows up in a house that is too clean and one that is far away from nature will suffer from a lack of stimulation of their immune system. Between 1-3% of children in Western Europe, Australia and the United States are allergic to peanuts. It is therefore traditional to advise parents not to give young children products containing peanuts. Peanut allergies are also on the rise in Asia and the African continent. These reactions can vary in severity, ranging from difficulty in breathing to swelling of the tongue, eyes and face, stomach pain, nausea, itching and, in the most severe cases, anaphylactic shock that can lead to death. However, a recent study indicates that avoiding peanuts during childhood could actually promote the emergence of allergies. Children, aged between 4-11 months, who received foods containing peanuts more than 3 times a week had 80% less chance of developing an allergy to peanut, compared to those who had never received one. Researchers also managed to cure small children who already began to display symptoms of peanut allergies, through giving them small amounts of peanut and gradually increasing the dose. Note that whole peanuts must be avoided with infants who may choke. It is better to feed them with peanut butter in small quantities. If the theory of hygiene holds true, you should perhaps think of switching to doing the dishes regularly by hand. You should also avoid being ‘too clean’ to strengthen and regulate your natural immune responses. As for your children, let them play outside and dig in the dirt. Even if they eat their boogers, it really isn’t the worst thing. When doing the housework, try and avoid using too many disinfectants and avoid antibacterial soaps and other household products that disinfect too abruptly (such as bleach). Your body needs to be exposed to microorganisms. Simple soap and hot water are enough to wash your hands. Also be sure to avoid unnecessary antibiotics and remember that they are ineffective against viral infections (so most colds, rhinitis, flu, gastritis, ear infections); they only work against bacterial infections. Eat organic products, and, if possible, those that you have grown yourself in your garden, with good compost and manure full of living microorganisms. And finally provide your immune system with the right foundation to regulate itself naturally!